Happy Typo Tuesday, everyone! I hope you all had a joyous Labor Day weekend, filled with lots of camping, barbequing, parades, boating, or just general laziness. My week leading up to Labor Day consisted of an awesome (surprise!) birthday trip with my handsome hubby to enjoy some epic white water rafting and camping in Pennsylvania. As part of Camping 101, it’s best to ensure you’re always prepared for whatever life may throw at you: poison ivy, dark trips to the bathroom, rushing rapids, or even the occasional bear (just ask Danielle about that one!) No matter what the situation, one additional thing that I can assure you I am always prepared for is a ghastly grammar error. 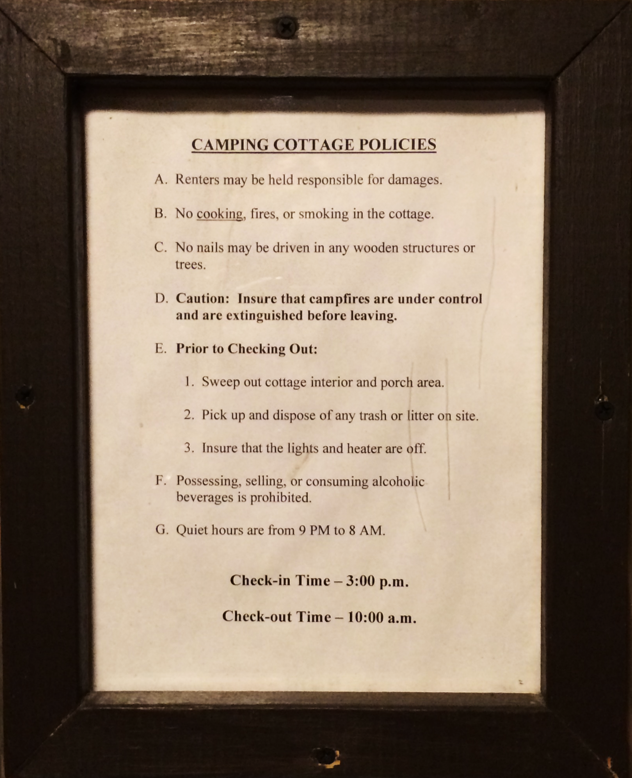 Shortly after we arrived at our camping cottage (i.e., cheater camping), I noticed the sign on the wall. Let me assure you, my grammar detector never turns off. Never. While the information in this sign was easy enough to understand, one word kept sticking out like a sore thumb. This one “little” error solidified this sign’s place in our Typo Tuesday column, ensuring that the error was (hopefully) not in vain. Okay, let’s take a step back from the Dr. Seuss tongue twisters for a minute. When discussing “assure,” “ensure,” and “insure,” it can be hard to ensure you stay on track. What’s the difference? The verbs “assure,” “ensure,” and “insure” all mean “to make sure”—for the most part. Some people argue that the three words may be used interchangeably, but it’s most accepted that their usage depends upon the context. Assure is to be used with a living being, in order to reduce anxiety or doubt. For example: “I assured her that the rapids were not as strong as they looked.” Remember that you can only remove doubt or anxiety from things that are alive. Both start with the letter “a,” which makes this easy to remember. Ensure means to guarantee. If I ensure something, I am guaranteeing that it will (or won’t) happen. For example: “Wearing this life jacket will help to ensure you don’t drown.” What’s the trick to remember this one? Guarantee ends with an “e” sound, which is what ensure starts with. Back to this sign for a moment: if you didn’t notice before, do you now notice that the word “insure” is misused two times? In both instances, “ensure” should be used. How can you ensure you don’t make silly grammar gaffes like this one? Insure your squeaky clean image by choosing to work with a top-notch marketing company. Writing skills are über important, and editing makes all the difference. Learn more by calling 888-886-0939, or by leaving a comment below!